Less than a year after the Towers crumbled, I fell in love with a newly-minted U.S. Marine. 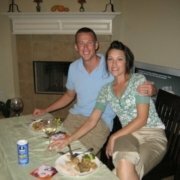 We met on the golf course at the old El Toro Marine Corps Base only a few miles from my childhood home. I’d just turned 19 and was working as a beer-cart girl for the summer. Tom was 23, a 2nd Lieutenant with dazzling blue eyes and a knee-weakening smile. He winked at me, and I’ve been smitten ever since. Only a few months after we started dating, Tom was ordered to deploy to the Middle East as a combat engineer platoon commander attached to 3rd Battalion, 7th Marines. 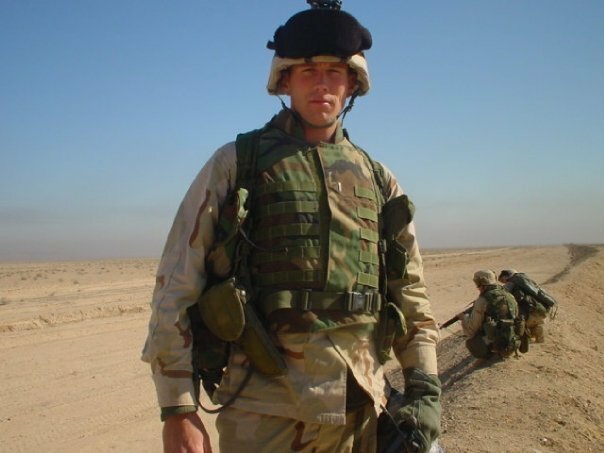 He spent months on the border of Kuwait and Iraq, waiting for the invasion that would signal the opening of the second front of America’s War on Terrorism: Operation Iraqi Freedom. A few weeks before he left, I watched him decorate a t-shirt in his sparsely furnished living room near the beach in San Clemente. He ironed on fuzzy, stenciled letters to read “F*CK TERRORISM.” I remember him wearing that vulgar t-shirt and thinking that, for him, 9/11 was personal; he had joined the Marine Corps in peacetime, and although a part of him was excited to go to war, I knew he was worried too. Not about his own safety, like I was; he was painfully aware of how many Marines he was responsible for, and he was determined to bring them home safely. I didn’t hear his voice for almost eight months, but sometimes I would read about his unit in the newspaper because a Wall Street Journal reporter was embedded with them. What I read made me worry, but I tried to convince myself that he was well-trained and focused and fit and capable. At the time, I was convinced nothing bad could happen to someone so young and full of life. 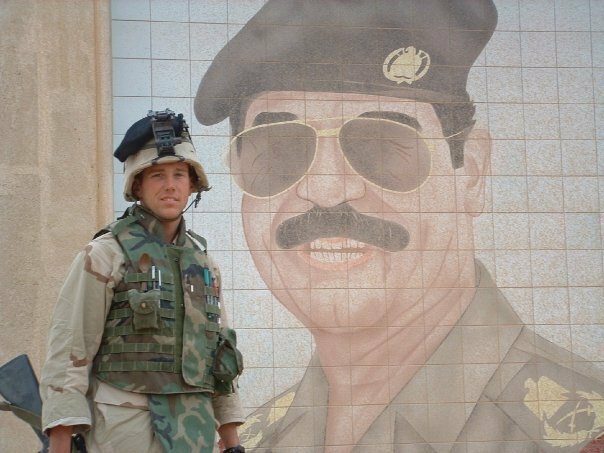 He sent me stacks of love letters written on the backs of old Meals Ready to Eat, and, after his platoon reached Baghdad, I even got a few on stationary from one of Saddam Hussein’s palaces. I wrote to him too. Every day. Hundreds of handwritten letters, each one labeled neatly at the top righthand corner with the number of days he’d been gone. I didn’t write about anything significant. I mostly just told him about my school work and my job and my friends. I left out the bits about how I spent hours in front of the television, hoping to catch a glimpse of him or his unit on CNN, until my eyes turned red and it hurt to blink. I didn’t tell him about the hours I spent with my neighbor, who had two brothers also in Iraq, following every battle and plotting them meticulously on a map pasted on her living room wall. I was obsessed, and somehow in my twisted logic, I thought that if I just cared hard enough, I could will him to come home safely. He returned the following year mostly unscathed, but almost immediately volunteered to be one of the first U.S. service members to embed as a trainer with the Afghan military. He was hungry for more, and figured that this was what he had signed up for; why not volunteer to go? There was no easy way to get mail to him on that deployment, but I wrote letters anyway and sent them to an address in Kabul. He didn’t get most of them. That was a rocky time for us, I felt abandoned and insignificant. We broke up and then got back together through a series of missed calls and nearly indecipherable phone messages. Most of the time, I had no idea what was happening to him or whether or not he was safe. There was almost no information coming from where he was in Paktika Province because it was considered the hinterlands, and there were no Western journalists crazy enough to go at that time. 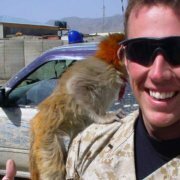 Every few months he would return to Kabul to organize supplies for the battalion of Afghan service members he was training and fighting with, and he would send me emails full of stories that, to him, were hysterical but absolutely terrified me. He once sent a photo, snapped by one of his interpreters, that showed him climbing out of his humvee which had been submerged over its doors in the middle of a raging river. In the photo, he’s laughing like it was all some great joke, but all I could think was that if this was his idea of fun, what’s the scary stuff like? I didn’t sleep soundly for weeks after I saw that photo. Truthfully, he did the best he could to stay in contact while he was there, even though it wasn’t easy, and I will never forget the sound of his voice on that scratchy satellite phone somewhere in the Hindu Kush when he called to wish me a happy twentieth birthday. It was the best present I’d ever received. Eleven houses and five combat deployments later, we still call the Marine Corps “home.” And this past April, I visited the place where an act of terrorism changed my life, and countless other’s lives, forever. Although my husband was commissioned in April of 2001, Sept. 11 was the catalyst for the wars he’s been fighting ever since he wore a single gold bar on his lapel. In the museum at Ground Zero, I spent a long time simply staring at the faces of the men, women, and children who died that day: strangers whose deaths, although tragic to me when they had occurred, have taken on new significance over the past 16 years. I am bound to those faces and those lives and those stories in a way I had never expected to be. Our entire adult lives, Tom and I have known nothing but these wars. I’m proud of him and his service, but I still wake up 15 years after we first met and worry about him, just like I did when he was 23. Ten years ago, he traded in the explosives for a pair of shiny gold flight wings. He said he wanted to stay operational. He wasn’t made to sit behind a desk. So, we continue. Him to fight, and me to worry, with no end in sight.